This review first appeared in the March 2018 issue of hi-end hifi magazine Audiophile Magazine of France. You can also read this review of SPEC's RPA-W3EX in its original French version. We publish its English translation in a syndication arrangement with the publishers. As is customary for our own reviews, the writer's signature at review's end shows an e-mail address should you have questions or wish to send feedback. All images contained in this review are the property of Audiophile Magazine or SPEC Corp - Ed. Having reviewed the entry-level integrated amplifier RSA-717 EX four years ago, it was a great pleasure to test a new amplifier from SPEC Corp. This Japanese manufacturer offers a range of products with advanced circuitry tucked into a very traditional appearance. Here 'traditional' refers to the grand era of Japan's hifi industry when Sony, Pioneer, Denon and Sansui designed components whose refinement was way ahead of what competitors offered. SPEC Corp also keep alive the artisanal spirit of the archipelago's smaller current builders like Yamamoto SoundCraft, Combak/Harmonix and Leben. Modernity + tradition = the twin essence of Japan? If so, SPEC Corp are a quite perfect example thereof. As mentioned, my first contact with the company managed by Tsutomu Banno led to my test of their entry-level integrated. That became a truly exciting experience which convinced me that class D could be addictive after all and produce a lifelike sound whilst outputting reasonable not extreme power. This was a rather different approach to generations of OEM IcePower or Hypex modules which delivered high power but, at least to my ears, also a fairly flat boring sound. SPEC's sound quality really impressed me, particularly in the wake of several tests of very big amps whose prices were in vastly different leagues than this Japanese budget effort. It was like some fresh air blowing from Mount Fuji. But it was also indicative of how the strategy of direct circuitry and very careful parts selection could compete with seemingly far more sophisticated albeit possibly also overly complex designs. Only the power limit infringed on true universality when faced with speakers of low sensitivity or impedance. Still, SPEC's top-line RSA-F33 EX remains on my 6-deep list of 2017's best integrated amplifiers regardless of price. Against this background, I was very enthusiastic to host in my dedicated listening room a pair of RPA-W3 EX stereo amplifiers with their optional H-VC5 volume controller [right]. This setup promised to increase the relevance of SPEC's offering into higher-power applications. That's because this amplifier works in stereo, dual-mono or bridge-tied load aka BTL modes. Today's RPA-W3 EX is only their second power amplifier, released just after the RPA-W7 EX unit which looks very similar but is smaller and lighter. The RPA-W3 EX enables a direct connection to an analogue source, bypassing a preamp in favour of their own dedicated volume controller to not only save money but avoid potential colorations and losses. Like many upscale Japanese products, the SPEC devices arrived packaged in a double box very well protected. The first surprise was their weight. It seemed much heavier than expected. This impression was perhaps a flashback of my previous RSA-717 EX experience. Its switch-mode power supply was probably lighter than the linear power supplies of all other integrated amplifiers of SPEC's lineup. After checking the data sheet however, each RPA-W3 EX puts just 11kg on the scales. That's relatively little given their size. The RSA-717 EX integrated had been just 7kg. Yet the RPA-W3 EX amps still featured a switching power supply so I had no reason to look there for the weight increase. Aesthetically the RPA-W3 EX are very elegant and without any ostentatious features. To my eye, they really do look classy. The logo engraved on the top is at once refined and unobtrusive. The wooden side panels are superb and make for beautiful contrast to the aluminium frame. But these wooden parts have other virtues than pure cosmetics. As a sandwich of two layers of German spruce around a core of Hokkaido maple, they become an efficient isolator tripod. These wooden species were carefully selected to provide just the right amount of mechanical damping. 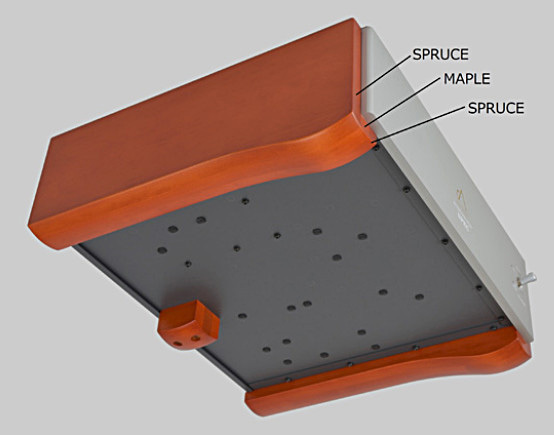 Being slightly curved, only the denser Maple core makes direct contact with your shelf. This wood construction has its origins in the city of Hida-Takayama of the mountainous prefecture of Gifu. It is famous for its woodcraft tradition, particularly for its furniture production.